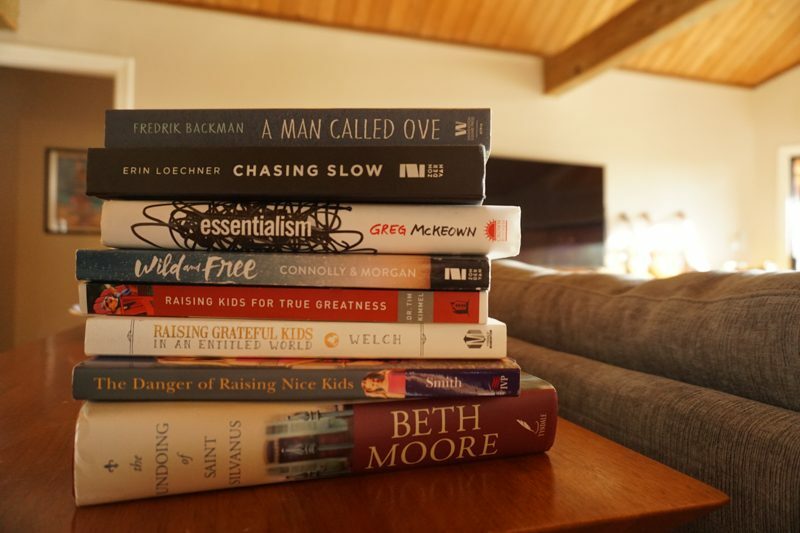 What I’m reading now…With a great new book giveaway! Like many of you, I typically have a stack of books by my bedside (and chair-side, and scattered throughout my house.) But the sad truth is: I have way more books than time to read them. Well, I’ve been meaning to share a few of my latest favorite books for a while, and now I have extra motivation: My friend Roger Thompson, just launched his brand new book this week! I mentioned it back in my coffee date post, but now…it’s actually here! For real. In book stores. And, of course, online, wherever books are sold. First of all, can we all agree that this is ^^ the coolest book cover ever? Roger texted me that photo many months ago and my whole family just stood there and stared at it. Without words I’m pretty sure we were all transported to that van…under those stars…ready to embark on some kind of an adventure. Well, if the cover photo draws us so easily into that scene, then try to imagine that times a thousand in Roger’s writing. 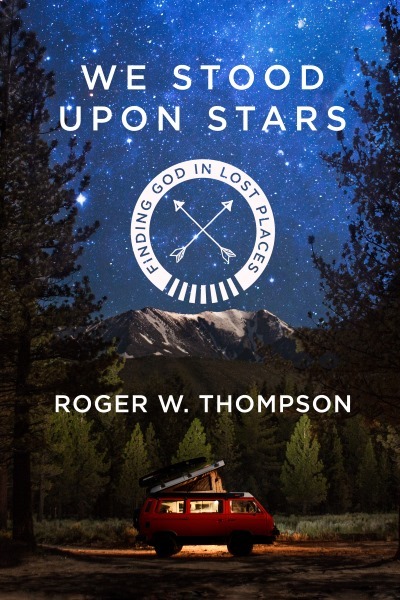 We Stood Upon Stars is a collection of travel essays which invite you along as Roger explores mountains, rivers, small towns, and more than one comical breakdown in his VW van. Each adventure offers thoughtful insights on faith, family, travel, and some really good humor. 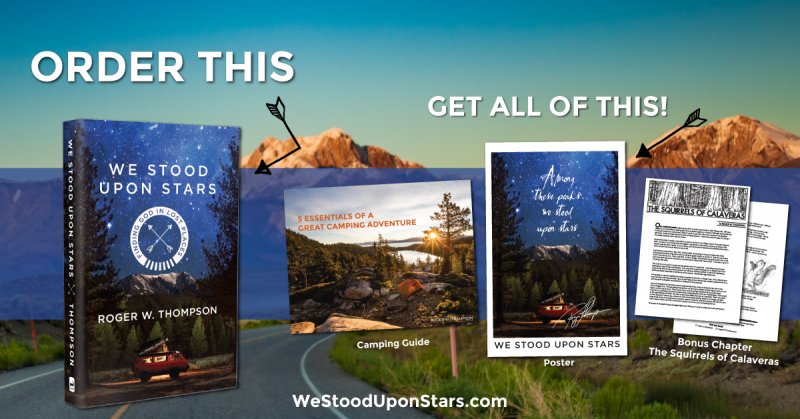 If you order We Stood Upon Stars before May 12th, you will get some of the best bonuses ever: There is a camping guide that is beautifully done, and may just change your life. (Or at least your next summer vacation — it’s so good!) Also included is a poster with that super cool cover photo( !) 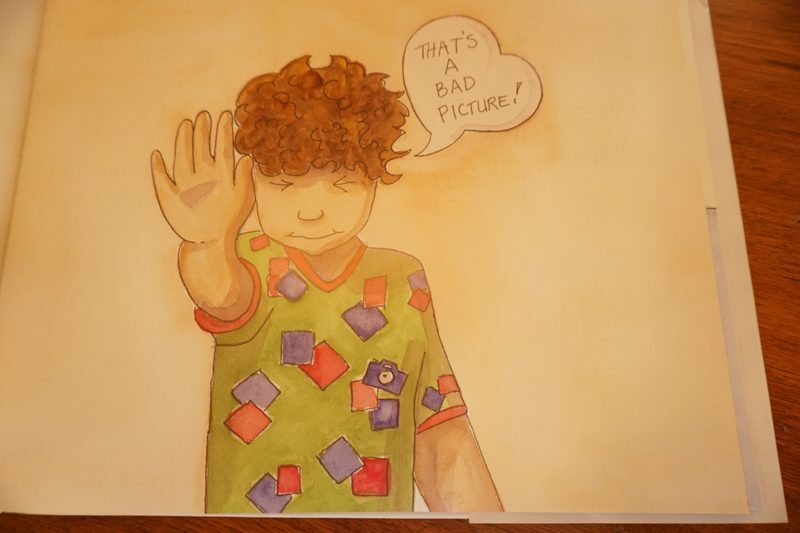 and a bonus chapter to keep you busy ’til your book arrives! TO GET THE FREE STUFF, just place your order on Amazon, then click HERE to fill in your order number. Then your bonuses will come right to your inbox! But only until May 12…so don’t wait! From surfing California’s coastlines, stargazing southwestern deserts, and fly-fishing in remote mountains of Montana, you’ll be inspired to follow the author’s footsteps and use the hand-drawn maps from each chapter to plan your own trips. There you will hear God’s voice – and it may help you find what you’re searching for. 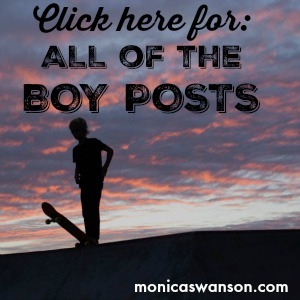 Ladies: Hopefully you’ll get the men in your life to read this (Father’s Day? ), but meanwhile you won’t be able to resist reading it yourself. Since Roger is not only a great writer but one of the nicest (seriously NICEST) guys you’ll ever meet, he wants to give THREE Of YOU a signed copy of his book! See bottom of this post for more on that. This book is about turning the idea of “success” on its head, and leading your child to find greatness in more profound ways than the world can offer. It is both common sense and spiritually- inspired. A great read. I met both Jess and Hayley (the authors) of this book at the only blog-related conference I have ever been to, (“Influence”) and I really loved them both. I knew the two of them would put together a really great book. Wild and Free is encouraging, refreshing, and full of love and grace. 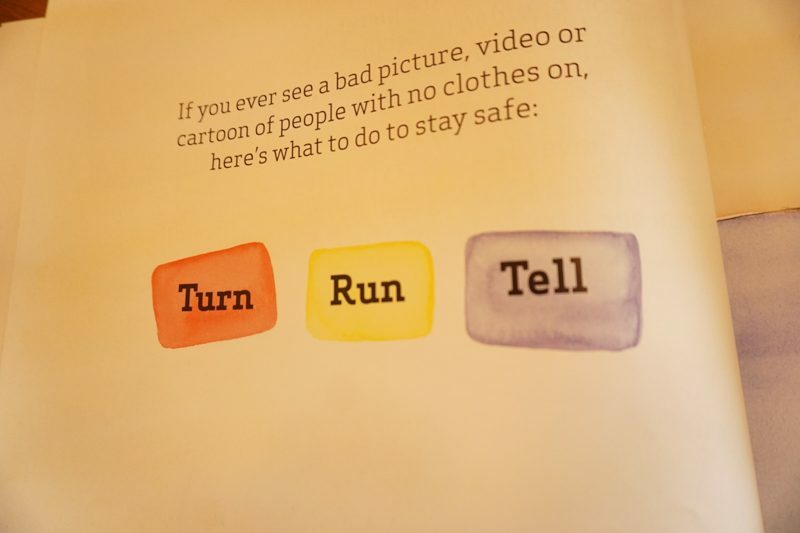 I think we all need what this book has to say, and often. Just starting this, but it came highly recommended by a whole bunch of people in the “online” community, (entrepreneurs, writers, and so on.) I’m pretty sure this will be challenging my priorities and could really change how I approach my days. I can’t remember if I have shared this before, but it is one of my favorites in the parenting realm. I keep opening it up again and again. Seriously America: We need this book. I’m just beginning this book, but no doubt Erin Loechner is a great writer, with a lot of insightful things to say. And even more: It’s put together beautifully! It is uniquely formatted and full of artistic features…I just love flipping through the pages! The Undoing of Saint Silvans : Did you know Beth Moore wrote her first fictional novel!? Yes! I’m waiting for my upcoming vacation to dive in, but can only guess it will be great! 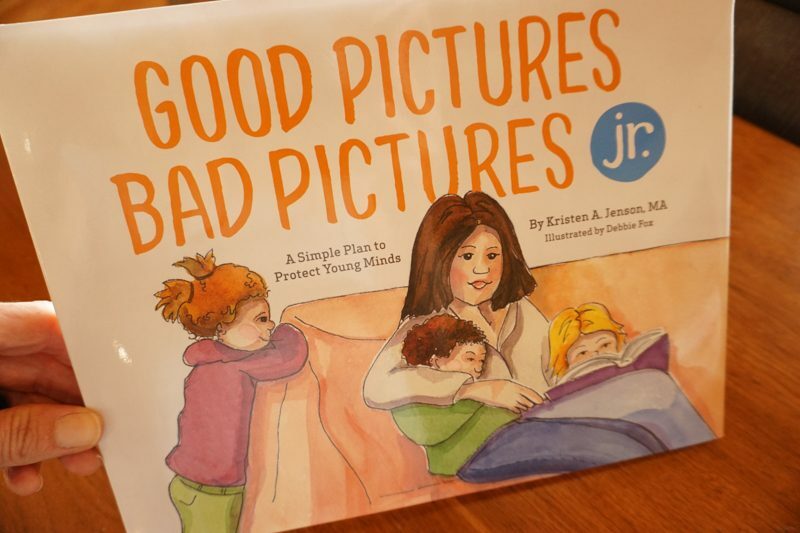 The brand new Jr. edition of Good Pictures Bad Pictures just launched! I read it to Levi and was so impressed once again! It was simpler than their first book, but still gave a strong and clear message. 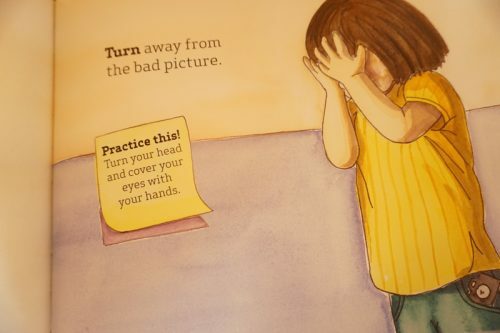 The illustrations are top-notch, and I just think this is incredibly helpful for equipping younger kids for any “bad pictures” they might stumble upon. Also: The hidden picture cameras throughout the book ^^ kept Levi on the edge of his seat. Brilliant addition to the book! To enter to win a signed copy of We Stood Upon Stars, please comment below sharing any ONE ADVENTURE (road trip, experience in nature/camping, or anything else!) that impacted your life, and what it did for you! On Wednesday morning, May 10th, I will pick THREE winners and contact you via email (so be sure to leave a good email address.) I’ll then come back and list their names on THIS post! **I am an amazon affiliate, so if you click through my links and purchase a book, I will benefit from the purchase. Thank you for supporting this blog in that way! 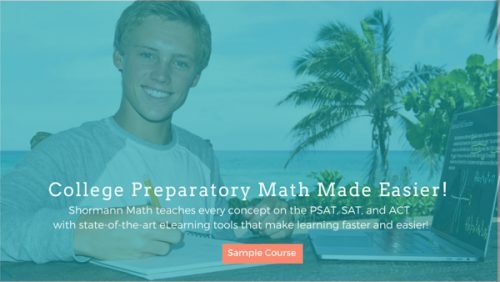 There was a Roger Thompson that taught at our son Nelson’s Voyager Grad School in Gig Harbor. I kind of wonder if it could be the same man. He was a wonderful teacher and a really good man. We traveled all over the NW for 25 years towing our 18′ Thistle Sail Boat We sailed in Pasco, Tacoma, Seattle, and Longview, WA; Lewiston, ID, Kalispell, MT; Portland, OR; Eugene, OR and probably a few others that I can’t remember. All three of our children were involved and as a family we have good friends in most these locations still today. It was a family event that we all remember fondly. I think it is the best thing we did as parents involving our children in a team event that they all loved. We treasure the friends we met sailing. One of the reasons I chose my husband was because I could see that he knew how to go on adventures. After we had a few kids we discovered that I don’t feel rejuvenated by our camping trips unless he takes the kids for a hike and lets me sit on a big rock all by myself for at least an hour. We learned that a big rock is an important part of the equation for me. The bigger, the better! Something about giant rocks embedded in the earth really ground me and help me reconnect with myself. I did not grow up camping, but through being a “Mom of Boys”, I have learned VERY quickly by becoming a Cub Scout den leader! What I have loved about Cub Scouts is that the camping is done as FAMILIES. We all work together to help small boys learn not only about setting up tents, but helping our friends with theirs as well as learning team work by prepping, cooking, cleaning together as one. Besides all the cool s’mores and skits and fun out door activities, I love “feeling God” in the outdoors with my den families. That has just wow’ed me with gratitude for all I have been blessed with. This book sounds like a terrific story to read to my family too! Two of my favorite things – finding a great adventure and bringing a good book along! My father and I started a tradition when I was 10 and I have carried it through now that I have my own family. Every year we head up in the Sierras for some hiking, fishing, camping, quality time, and plugging into the beauty of nature. It is these magnificent places that you feel totally connected to the universe and to God. When my kids finally go to sleep I crawl in the hammock with my head lamp and get some alone time with my book. Vacations are when we get energizesd and refreshed so we can be productive in our normal routines. Always looking for a good read and motivational words. Mahalo Monica – thank you! Thanks for sharing from your adventures! An adventure that truly impacted me was the last one I went on…last week! I went to the US and British Virgin Islands and snorkelled for the first time in my life. When I put my head below the salt water, I jut about fainted! There was a WHOLE NEW WORLD down there! I had no idea. I mean, of course I have seen “Finding Nemo” and photos of the sea, but I had never witnessed this amazing world for myself before. We were snorkelling at coral reefs, so the marine life was just incredible: a whole rainbow of colored fish, turtles, coral in every shape, size and color, sea urchins, other sea creatures…..all getting along in such harmony, too. The only sound I heard was my own breathing, but everything below the surface was as alive as could be. If you don’t believe in God, just stick your head below the water at a coral reef! Nothing man-made could ever be this beautiful and moving. My son was conceived on a road trip with my husband through the Grand Canyon, Arizona, Utah and Nevada! Pretty productive road trip I would say! I’d say pretty productive indeed! 🙂 Love that. Robert will love this book for sure! Every Memorial Day weekend for nearly twenty years now, we’ve gone camping with the same group of incredibly dear family and friends. It began back when I was still in high school. My husband came along before we were even dating. The group grew as husbands and wives were added, then babies, then LOTS of babies, then even more babies while at the same time the first ones had become teenagers. We see each other throughout the year in gatherings of various sizes, but there’s nothing quite like those four days together each spring. Four days of fun, adventure, lots of wonderful food, singing around the campfire, catching up on life, sharing our burdens, talking about Jesus, working out conflicts among the kids and sometimes working out conflicts among the adults. But most of all, four days of being known through and through by those on this planet who love me most. Just three more weeks and we will be there! Womens retreat when I was 14/15 yrs. old where I was able to work thru emotions of losing my stepmom to cancer. When I was in college, I made the decision to join a rock climbing club. Best thing I could have done for my nature loving soul. During the fall one year in Arkansas, we went climbing inside of this beautiful canyon. As the sun was setting and the stars were starting to appear one by one, faint at first, and then bright against the black night sky, I remember feeling overwhelmed with how beautiful God’s creation truly is. He didn’t have to design it so intentionally and magnificently, but He did. Thus began my love-affair with looking for and finding evidence of my Saviour in the nature around me. Monica. I would LOVE a copy of Roger’s new book! The cover is captivating – especially because the mountain in the background looks like the mountain I see outside my front window every morning. My husband and kids love the idea of camping and I have yet to get on board. :/ The last camping adventure I had was in college when I took a group of high school students on a Young Life “Wilderness” trip. Five kids later and many years later, I have become more fearful over the thought of sleeping under the stars. I don’t want to miss out on adventures with my children and husband. Maybe the book will inspire me to start a new tradition with my family??? Thanks for your words and your overall cuteness! I feel the same, Heather. I need more of this in my life, even though kids make everything a bit more challenging…I do think the book will inspire you! 🙂 Much love to you, and thanks for being so kind always. My family went on an 18 day camping trip when I was a kid-from Yellowstone to Redwoods to California to the Grand Canyon and back . It was wonderful family time and a great way to see many of God’s wonders. It remains a favorite memory. Family camping trip to Hickory Run State Park, Boulder Field – we trekked across entire field and found the “secret” section – learned a few things along the way, about perseverance, creation & helping one another keep going. Camping as a family is new to us and we’re LOVING it. I hope to build our family connections through many more trips (which help us to “unplug” for days at a time). 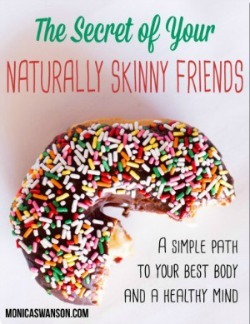 Would enjoy reading this book for motivation, and for dreaming! Camping on the Oregon coast, looking at stars and ocean and feeling God there. Climbing the back side of half dome and scaling the rock by cables was a great experience for me and proved to myself what I could mentally and physically accomplish. Once on top, the views were breathtaking. The best artist to ever exist is God. Loved, loved, loved A Man called Ove! I have my own curmudgeon… so identified, smiled, chuckled and cried as well! I would love the book & I think my 15 yr old son would too. Love the picture on the cover too!! Would look super cool in his room. We love camping (in our trailer so maybe to some not camping but it is to me!) My favorite place to be in the world is to be reclining in my chair in the campground of Yosemite with a book by my side & looking up into the trees & relaxing. So my happy place! Whenever I get stressed I just think back to the feeling I get when I’m there. I just absolutely love being in Yosemite. A Man Called Ove is great! You will love it! yay! Thank you. I can tell already! An educational tour across 7 prefectures in Japan not only provided me with insight into another school system, but experience being truly illiterate in rural areas ( No English any place! ), and a deep understanding and appreciation for the Japanese culture. Came in handy when I met my Japanese-American husband a few months later! It didn’t, however, foster a love for sushi. Am I the only one in the world who thinks sushi is just meh?